The Tahiti Vanilla is the most treasured and most expensive Vanilla of the World (Vanilla tahitensis). The Vanilla belongs to the family of the orchids and is a hybrid of the vanilla aromatica und vanilla fragrance. The Tahiti Vanilla grows on the Island Tahiti. She is cultivated only in small quantities and there are only 15 Tons available in a good year for the world market. 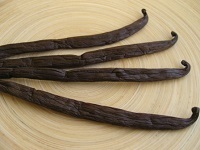 The Tahiti Vanilla is compared to other kinds of Vanilla way thicker due to the fact that this vanilla ripens fully on the liana. The Tahiti Vanilla is used by the perfume industry and for the haut cuisine.